Keep your universe with you anywhere and on any device you like (USB memory stick, flash drive, portable hard drive, etc.). You can share the widgets you have created by posting them in the Share Zone. To do this, click on the title of the widget in the Widget Manager and click on the submit button. 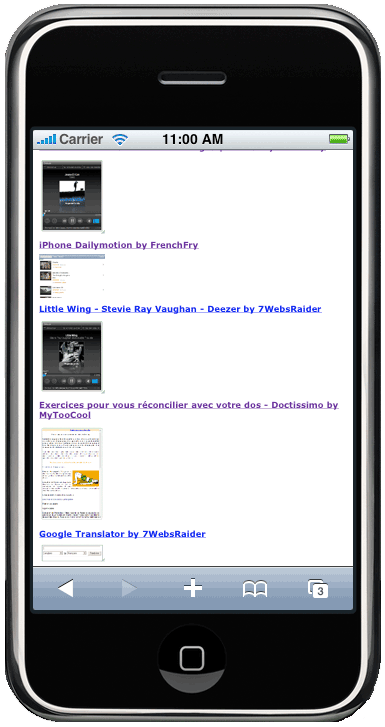 MyTooCool will then send the files and information related to your widget to the Share Zone. All others users will be able to access it and use it. While navigating on any website, MyTooCool enables you to select objects and create your own html page with these objects. Whenever you open this widget, MyTooCool will automatically open the html page. The html file is saved locally on your PC but can access the content of the widget on the source website (e.g. to import videos to the html page from a given source website). As source sites can change, you are advised to start by creating a static widget rather than a dynamic one. While navigating on any Internet website, MyTooCool enables you to select objects and create your own widget with only these objects. Whenever you open this widget on your PC, MyTooCool will rebuild the widget so that its content matches the content on the source website. This type of widget is useful if it is linked to specific content that is dynamically updated on the source site. If not, you are advised to create a static widget as the site may change, meaning that your dynamic widget no longer works. Click on the title of the gadget in the search widget if you want to send it to friends. Enter your friends' email addresses and an email with a reference to the widget will be sent to your friends. What configuration do I need to run MyTooCool? You need Windows XP SP2 or later with Internet Explorer 7 or later. Make sure there is no firewall blocking the software (Apache service). Yes, MyTooCool is family software. Each user can manage their own account and gadgets. Your password is stored locally so we can't recover it for you. Please create a new account. MyTooCool "Hunter Browser" is slow compared with other browsers! That’s because it has to think a little bit. The "Hunter Browser" is not designed for navigation purposes. Use other browsers to navigate and copy/paste to MyTooCool Hunter Browser the url of the page from which you want to create a gadget. I have created a new widget but can't find it! It is there somewhere. The new widget is usually saved in the selected internal widget of Widget Manager. If not, look in "Default Widget" or in the internal widget that is on top of the others. It depends on the speed of your PC and the number of elements on the web page. Try Hunting Mode Fast. If you cannot select the objects you want, you can proceed in stages. First create a widget with content containing these objects. Then use the 100% mode to change the widget and add the target objects by clicking or dragging and dropping. It depends on the speed of your PC. Do not release the mouse button until you see the object detached from the page. Move your mouse around a little while waiting for this to happen. I love the buttons effect but am having problems getting the right one! This will be improved in future releases. Just take it easy when catching the buttons and the right one will come up. You just need to practice a little bit. I can't move my widget! Depending on the objects inside the widget you may not be able to move it by clicking inside it. If this happens, click on the grey border to move the widget. If your PC is slow and busy running the widget itself (video for example), it may take some time before the buttons display. Stop the video or other media. Retake screenshot is too slow or does not work! Again, stop the video or other media while taking a screenshot. I copied my MyTooCool installation directory to my removable device and MyTooCool does not start on an other computer! Please ensure that the original directory is not protected by NTFS permissions (ex: MyDocuments). For any of you out there who would like to create widgets, here are some tools and suggestions. Then select and open your gadgets. With MyTooCool, create and customize your own widgets from any site or multimedia element! MyTooCool is a cool piece of software that allows you to easily create your own widgets and add them to your desktop. MyTooCool helps you create widgets from any part of a website (page, part of a page, movies, pictures, RSS feeds, etc.) or from any multimedia element on your PC or the Internet (images, videos, music, etc.). It also offers widget management capabilities. - sharing your widgets by posting them in the "Share Zone"
... click on left buttons to get more details on MyTooCool features! Use the 100% mode to select the objects you want to capture. Then click on the last chance button to create your widget. Some objects with special protections or unusual properties can be hard to capture using MyTooCool Hunting Mode. For these objects, use the last chance button. Click to activate / deactivate MyTooCool Hunting Mode. When activated you can select the objects you wish to turn into widgets. Click to create a dynamic widget. Drag and drop outside to create a static widget. Selected elements have a dotted pink border. If your PC is slow or the web page contains many elements, use this mode to create your widget. It works faster than Hunting Mode. Selected elements have a dotted yellow border. Drag any elements on the page that you wish to remove (such as ads) and drop them onto the trash button. Then click on the create static button. This will create a widget without the content you have removed. Depending on how the site is set up, you can use this feature to create a static widget from the whole site without the unwanted elements you have removed. This widget will work as if you were on the real site. 100% mode allows you to set the size of the selected elements to 100%. You can then use the create static/dynamic or last chance buttons to create your widget from the resized elements. This mode is also available once you have created your widget. It allows you to fine tune your widget if it does not render as you wish and to focus on the elements you want to emphasize. You can manually refresh the content of your widget by clicking on the "Refresh" button. If you want to refresh it automatically then define the refresh period with the arrows. If the content you have captured is bigger than the widget, click on this button to add a vertical scrollbar. This button allows you to create a widget RSS reader from a valid RSS Feed. See "dynamic widget" section to understand the difference between static and dynamic widgets. First use 100% mode to select the objects. Then click on this button to create a dynamic widget from the selected objects. First use 100% mode to select the objects. Then click on this button to create a static widget from the selected objects. Create a widget from a direct link to a multimedia object on your PC or the Internet. By selecting a multimedia object on your PC (video, music, pictures, etc.) or entering the URL of an object on the Internet, MyTooCool will automatically create a multimedia widget. Create a multimedia widget from permalink or source code. Some sites provide a permanent link to the multimedia objects they contain or the source code for these objects. You are advised to create your static Widget from the permanent link or the source code (copy and enter it in the MyTooCool internal widget url) rather than using Hunting Mode. If you use Hunting Mode to capture these objects and they are then redefined dynamically, the widget may no longer work. Search and publish a widget in the "Share Zone"
- open internal widget using a keyword that will display screenshots of related widgets. Then click on the screenshots to open widgets. Drag and drop the screenshots to save them in your widgets. - open external widget using a keyword with full list and details of related widgets. Then click on the screenshots to open widgets. Use the save button to save them in your widgets. Click on the title of the widget if you want to send them to friends. Enter your friends' email addresses and an email with reference to the widget will be sent to your friends. The Widget Viewer allows you to display, hide or close the widgets that are open and to access the context menu of these widgets. MyTooCool est une application révolutionnaire vous permettant de créer vos propres widgets à partir de n'importe quel élément du web (page, élément de page, vidéos, images, flux RSS...) de façon simple afin de les intégrer à votre bureau. Change the widget container image using an image from your PC or the Internet. Select the color you want for the text of internal widgets in the Widget Manager. Select the color you wish to use on mouse over of Widget Manager internal widgets. MyTooCool takes an automatic screenshot of your widget when it is created. If it fails or if you don't like the screenshot, use this button to take it again. Make sure you have a nice, valid screenshot before posting your widget in the "Share Zone". Change opacity of your widgets and the Widget Manager. When a widget is created, its default background is white. The site your widget was taken from might have defined a more suitable background such as an image. Click on this button to restore the original background. Select the color you wish to use as your widget's background colour. You can also choose to make it transparent. Change the background image using an image from your PC or the Internet. Display the widgets you have created in the selected internal widget category. MyTooCool allows you to store your preferred links for widget creation. Use this button to display them. Click on Hunting image to navigate on the link. Force update. MyTooCool will restart. While activated, your widget will stay on top of all other windows. Add an internal widget in the Widget Manager. These widgets are used to save and organise your widgets by category. Give it a name and press enter to create it.